What is an arch wire? The arch wire is the metal wire that goes across your braces, from one end of your mouth to the other. You have two arch wires; one on top and one on bottom. The pressure from the arch wire is what helps to move your teeth. 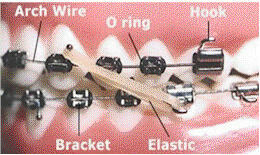 A ligature (also called an "o-ring") is a tiny elastic that holds the arch wire onto each bracket of your braces. Ligatures come in a variety of colors. Some brackets are "self-ligating," which means that they do not need the little elastics to hold the arch wire onto the brackets -- instead they have a "sliding door" system for keeping the arch wire attached to the bracket. Why do I need to have spacers put in before braces? Sometimes there isn't enough space between certain teeth to insert a metal band or other appliance. Spacers help move the teeth slightly to create space that is needed for your treatment. For more information, read What are Orthodontic Spacers? In a nutshell, the ligament surrounding the teeth is loosened, allowing the teeth to move. For a more detailed explanation, and illustrations of the parts of braces, read How Do Braces Work? Is there a big difference between metal and ceramic braces? All the pros and cons are outlined in What Type of Braces are Best? Why are there hooks on my brackets? Hooks are for attaching elastics (rubber bands). At some point in your treatment, your orthodontist may tell you to wear rubber bands that attach from a hook on the top brackets to a hook on the bottom brackets. Elastics help to close up your bite and correct things like midline problems. This all refers to the way your top and bottom teeth meet and align with each other. Why are there little tubes on my molar brackets? How long have braces been around? Braces, in one form or another, have been around since ancient times! For an interesting article about the history of braces, read A Short History of Braces and Orthodontics. Yes, at first they do. For me, it felt like I had been hit in the teeth with a baseball -- but everyone's experience is different. Your teeth will ache to some extent and your gums will probably get sore in specific places. This is because your teeth are not used to the pressure, and your cheeks are not used to the metal or ceramic rubbing against them. After wearing braces for a few weeks, the pain and discomfort begin to diminish. You can use dental wax and topical anesthetic to help create a barrier between the braces and any sores that develop on your gums (the sores usually heal within a few weeks). You can also use a lip protector. In a few months, pain is less of an issue, and it goes away. You sometimes even forget that you're wearing braces! Your teeth may also hurt again for several days after your monthly adjustment, but by then you're used to it and it doesn't bother you as much. When you first get braces on, your teeth will hurt or you may be in some amount of discomfort for several weeks. After about a month, it is better. In a few months, you may even forget that you are wearing them. Within 3 months you will be able to eat almost anything you like. In six months, you might even be biting into hard cookies, chips, and crusty bread once again. Eat these things in moderation and always be careful. "Forbidden" foods and soft foods are mentioned in the next section.